‘I don't have a team taking care of my dogs. I take care of them 24/7|! !| every day of the year. It is an enormous commitment and a labor of love|! !|’ says Lidia Dale-Mesaros|! !| owner of Valley Snow Dogz in Thornton. 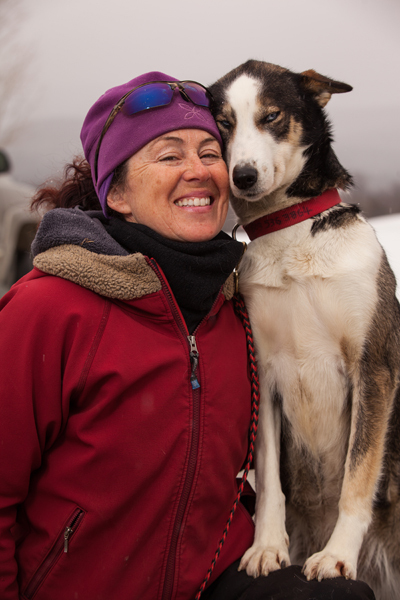 Growing up in the United Kingdom, Lidia Dale-Mesaros had always dreamed of owning a team of sled dogs in the White Mountains of New Hampshire. After mushing dogs for nearly 20 years, she considered turning the hobby into a business when she was asked to give tours for charity work. Valley Snow Dogz is now in its fourth season of business, giving dog sled and wheeled tours from mid-October to early April at Benton’s Sugar Shack in Thornton, as well as excursions on Squam Lake and Waterville Valley Resort. Dale-Mesaros runs the company with her husband and friends. Q. What sparked your passion for dogsledding? A. I don't really know how it originated for me other than I recall looking at photos in magazines of mountains in the USA and dog teams back when I was a child. So this childhood dream was over 40 years ago, pre-Internet. I did explore the reasons why I have always wanted to do this and discovered through past life regression that I had sled dogs in a past life so I guess you could say it's in my DNA. I have not run my dogs professionally. It has always been my hobby and passion for the love of it. Q. I see you partner with Team Kelim Siberians. How does that work? A. Team Kelim are twin sisters Kim and Kelly Berg. I met them when they were 13 years old (22 years ago), when my husband and I first moved to the USA and bought our first sled dog. They were working at the kennel where we bought our dog. We became friends and, as we each grew our own kennels, we would pool our dogs together to make one big team. We learned how to mush and how to train dogs together. We are best friends; we are like family. When I set up Valley Snow Dogz, it made sense to invite the girls to work for me, as we run our dogs together all the time and function in the same. I sometimes feel like a “third” twin. We consider ourselves to be a family of mushers. Q. I noticed some of the dogs are related. Do you breed and raise huskies? A. My husband and I have Alaskan Huskies and Kim and Kelly have purebred Siberian Huskies. I don't have a team taking care of my dogs. I take care of them 24/7, every day of the year. It is an enormous commitment and a labor of love. I couldn't imagine life any other way. I will have the occasional litter when I need to. All my pups are raised and trained by me. All my dogs are house-trained, and each night there is always a bunch of them sleeping on the sofa or on the bed. They are very versatile. They can go from sub-zero temperatures to enjoying the heat of the woodstove! Q. How do you train the dogs? And how do they know when to turn? A. We start training in September using our four-wheelers. Nice short, steady runs to build strength. We start teaching new dogs or young dogs what is expected, and they also learn from their peers. Lots of positive praise and bonding. Hours upon hours of training and together time. We teach them a number of verbal commands such as right and left turns, which are “gee” and “Haw,” stay on the right side of the trail – “gee over” or “gee side,” go “on-by” obstacles or distractions. Leaders are taught to hold the line out tight while we hook up the team members, they will stand patiently both at the start and at the end, when we do the reverse and take dogs off the line. Q. Do customers sit in the sled or can they also be taught to stand and drive the sled? A. Mostly our customers sit in our traditional toboggans, but we do have a “double-driver” sled. It's kind of like driver’s ed. We have two standing positions, the customer will stand behind the guide and learn a little about the art of mushing then the guide will switch places with the customer. They get to stand behind the team while the guide remains in full control, keeping everyone safe. Q. What is something people don't know about mushing and dog sledding? A. That the dogs love to run and pull, it's in their DNA, just as mushing is in mine and that the bond and relationship we have with our dogs is life-changing.